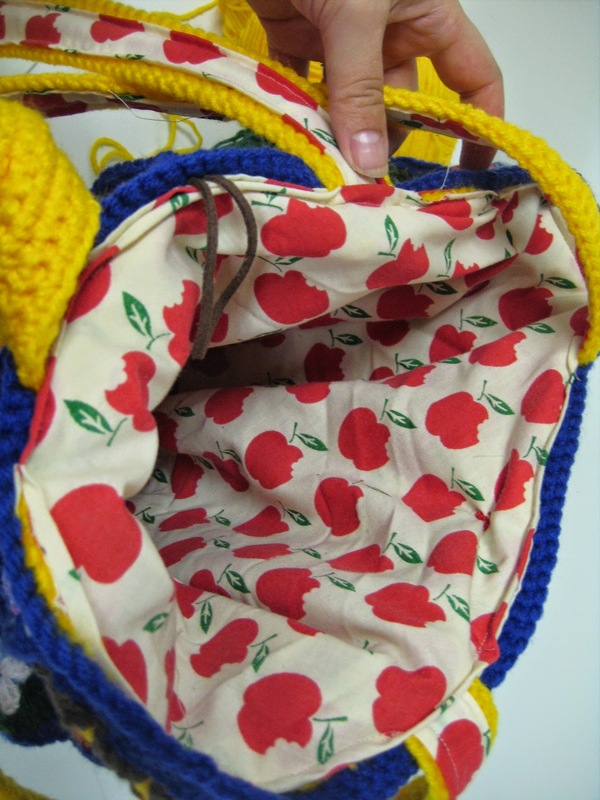 The L-T Experience: My Winter Purse: Granny Square Love! I am in love with the backpack bag that I made to use this summer. It was perfect! But it's not so good to use in the autumn and definitely a nuisance in the winter. Backpacks don't really fit over huge winter coats. So I knew that I had to make a new design for the changing season. I also knew that I wanted to make something that incorporated granny squares - but there was no way I was going to attempt an afghan again. It was super easy to figure out even going into details about actually making all those granny squares. Phew! Nice and big and colourful. A perfect bag to drive away the winter blahs. I lined it with fabric from a vintage sheet I found at Value Village. Fantastic fall apples. I always like to line my bags with a lighter/brighter fabric because then it's easy to see what's at the bottom. I've been using this bag for about a month now and it's working out great. I think this one is definitely a keeper! Link to my Berkshire bag project on Ravelry.